Two decades ago, I studied for my Post-Graduate Diploma in Marketing. It was HARD! I thought that with a relevant degree and five-years experience in Marketing, the Diploma would be a breeze. Boy was a wrong! The Chartered Institute of Marketing (CIM) curriculum was thorough, and the assessments and exams were the hardest I’d ever come across. It quickly became clear why the CIM is recognised throughout the world for its high-quality training and standards. 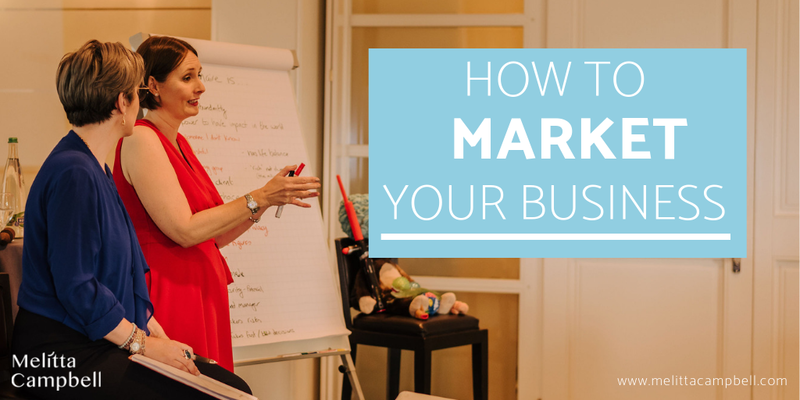 So, having studied Marketing intensely and worked in the field for more than 25 years, I can see why so many new entrepreneurs and small business owners get themselves in a pickle over the conundrum of how to market their business. But on that scale, marketing your business can be very simple. I know that many small businesses put a lot of time and effort into identifying who exactly their clients are. They research what they like and dislike, what challenges they face on a daily basis, what their hopes, dreams and concerns are, and what their background is. But many don’t! If the later is you, then stop reading right now and do your homework – your entire business depends on it! Success in business is all about creating products and services that solve a client need – but if you don’t know who your clients are, you won’t be able to do this well, and certainly not as well as another competitor who takes time to get to know the customer’s needs and preferences. So small business marketing principle number one is all about getting to know your customer and then filtering this understanding into all of your business processes and decisions. So I know you probably think you know all about yourself and your business already, but do you really? If Sir Richard Branson were to knock on your door right now and offer to invest in your business if you can tell him in 30 seconds why he should, could you? Small business marketing principle number two is all about knowing why you are in business. Understanding why you care about solving your client’s problem and how you do this in a way that is better or different to anyone else in the market place. Explore all the ways you create value and how you can communicate this. “Success isn’t always about greatness. It’s about consistency. Once you know your customer, and you know the value you can deliver for them, the next step is to help your customer to know, like and trust you. The key to this lies in Small business marketing principle number three: being consistent. Use the information you know from principles one and two, to create desirable products and services, to give them the right look, feel and price and make them available in places that are convenient to your customers. Then make sure your customers know all about you and your offering and the benefits it offers by investing time in your marketing every day, using consistent messaging. On average, people need to experience something at least seven times before they start to take an interest in it and consider buying from you! So in being consistent, you may feel that you are boring your customers with the same message, but you’re not, you are building recognition, credibility and trust. So, now you have everything in place to help you attract the right people to your business, it’s important to get feedback from your customers to check that you are doing a good job at the right things. It’s easy to create content and send out emails and assume that everyone got your message but in fact, that is rarely the case. You need to check which messages have reached their intended audience intact, and which ones need to be repeated, redone in new ways, or reinforced. Customer research and understanding is key when it comes to not just building your marketing strategies and campaigns, but keeping these going over the long-term. While consistency is important, it’s also important to remember that times, trends and preferences change over time. Small business marketing principle number four is all about staying close to your customers to test your marketing and stay on the pulse. Marketing efforts that focus on paid promotions and gimmicks can get very expensive very quickly. What’s more, their effects are often short-lived as these tactics are not focused on building relationships or loyalty. Building a community, however, is a great way to market your business at very low-cost, while also staying close to your customers. In principle number two, I talked about the need to know why you care about solving your client’s problem; small business marketing principle number five is about demonstrating that by creating a community around your product or service. Social Media offers you a very convenient way to do this. The idea here is to allow your customers, and potential customers, to get involved and geek out with you on a theme related to your business and products – and their passions. So if you are an Interior Designer or a Stylist, for example, your community would be all about sharing the latest looks along with tips and tricks on how to achieve them. If your business is linked to wellness, you’d be wanting to share healthy recipes, tools, tips and inspiration to help people stay on track with their good habits. Include lots of user-generated content in your community and encourage people to join a conversation – or better still, a movement! Given that of all the people who could potentially consumer your product or service, only a small percentage are ready to buy from you in the next week, it makes a lot of sense to build a community so that when people are ready to buy, your brand is front of mind. Couple this with the fact that the average customer needs to experience your business more than seven times before they will buy from you, the case for building a community is compelling. When building your community, the rule to remember is that the community comes first and not your business, brand or product. Keep posts promotional posts to a maximum of 20% of your content. As with all things in business, you need to create a well through-out plan to guide your marketing efforts. Your plan needs to include not just your planned marketing activities (which are fully aligned to your wider business strategy), but also include clear goals and measures so you can keep on top of what’s working and what needs to be changed or further optimised to ensure you get the best results for your marketing budget. While small business marketing principle number six may not be the sexiest piece of advice on this page, it is certainly the most important. If you don’t have clear and specific goals for your marketing, and if you don’t know how you are going to measure your effectiveness, you will waste a lot of time, effort and resources. So, now you know the core principles behind effective marketing for your small business, you are probably wondering HOW exactly you can get your business out there. While visibility and promotion are only part of marketing, getting enough eyeballs on your business is a very important part. To help you, in this document I’ve compiled a list of more than 100 ways you can market your business for free! Plus a few paid options along with some tips and inspiration to help you market like a pro. click here and tell me where to send it. If you are looking for help launching your business and building a sustainable pipeline of clients, my Dream Client Blueprint program will exactly this over 12-weeks. Its mix of online training, comprehensive workbooks, 121 feedback and online community will ensure that you get clear about your purpose, learn how to communicate this with impact and know how to build a winning marketing, visibility and engagement strategy that you can implement with confidence. Where will your business be 3-months from now? Running your own business is a wonderful way to open yourself up to a world of fulfillment, possibility and choice. or reach the next level? Copyright © 2017 Melitta Campbell®. All Rights Reserved.